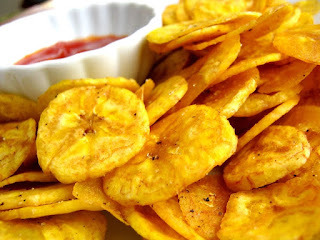 Plantain Chips are crunchy Nigerian snacks made with either ripe or unripe plantains. Plantain Chips which is made with unripe plantains are bright yellow while those made with ripe plantains are deep yellow in colour. It is also known as sweet banana chips it is great and healthy for all ages. You can take for Launch or Give it for your Children as a welcome Market gift for parents. Plantain chips production is one of the easiest businesses you can start in Nigeria if you want to generate quick cash within a short space of time of starting. We deem it necessary to post this Training just to properly welcome you to this year 2016, so take this opportunity by venturing into this Business after learning what it take in starting it. The reasons why plantain chips production business is easy to set up is because plantain chips is a snacks widely eaten by all. The startup capital requirement is low, and you don’t need to rent a shop to start and plantain is readily available in the country, especially in Lagos, South/Middle belt regions of Nigeria. With an initial startup capital of around #13,000, you can generate an income of at least #80,000 per day when you are able to produce about 1,000 packets of plantain chips on daily basis. If you dream and want to venture into this business, here are the basic requirement you must have at hand. Wash and peel the plantain. • Slice the Plantain into a bowl of water. It is advisable to use a vegetable slicer to it will be equal, the water helps prevent the plantain slices from changing colour. Then start frying don’t make it too brownish in colour. You can make yours very tasty by adding some other ingredients apart form the normal chips seen on the streets, add a little ginger,galic and pepper to it, this will make your customers ask for more and it will bring a lots of turnover at the end of the month. You can start by telling your neighbors, collegue in the office showing a sample of your chips. Print a label on your chips with your company name it, social medias like facebook, twitter, whatsapp is also another good place to market your business. Business Name is the name you want to give your business, it is the name you want to be known, some companies like Gala, Chi Limited, Cakes and Creams e.t.c are names that are popular, unique and appealing. We would recommend Strongly that you find out what your unique selling point are and your real strength You must allow your target customers know your unique selling proposition in selling that product to them. Let them know the value in paying for the premium of your product. Coca Cola has a taste that no other beverage has in the world, and that makes it unique and sells everyday.